It's simple! 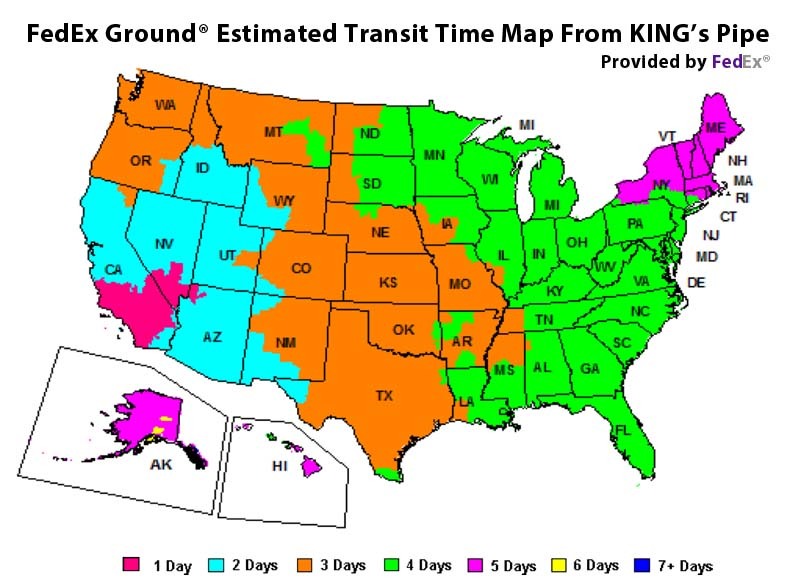 We here at KING's Pipe Online Headshop value our customers and provide FREE SHIPPING (via USPS - 7-day delivery) on ALL orders, to any location in the United States, including Hawaii and Alaska. Enjoy free shipping on all items throughout our online store! It is our prerogative at KING's Pipe Online Headshop to take our customer's privacy into consideration, which is why we ensure discreet shipping for every order. Following a purchase, products are shipped to you in an unmarked box or envelope, with a shipping label and FRAGILE sticker on the packaging. Aside from our standard 7-Day free shipping, faster alternatives via USPS and FedEx are available. USPS and FedEx shipping rates are based on the weight of the package and your location. Before the final checkout page, you may opt for a faster shipping method of your choice and continue on to place your order. These shipping options are non-refundable. If in the event of a canceled order which has already been sent out, KING's Pipe will only refund the actual price of your purchase, NOT INCLUDING the alternate shipping fee. Please be advised that the expected delivery date provided by your carrier of choice, are merely estimates and DO NOT guarantee arrival. This is especially pertaining to USPS Priority Mail Service. Possible factors affecting ETA could be weather conditions, etc. Please understand that KING's Pipe will not be held responsible for such occurrences. Thank you! All orders are usually shipped within 24 hours of purchase. If an order is placed during operating hours, then it's likely to be sent out that day. Please understand that during peak seasons, packaging may possibly be delayed to 48 hours. Business hours are Monday - Friday from 10am - 4pm PST (as we are located in the West Coast) Also, KING's Pipe Offices are closed during major holidays. Business hours are Monday - Friday from 9am - 5pm PST (as we are located in the West Coast) Also, KING's Pipe Offices are closed during major holidays. We will send you an updated email with your tracking number included, once your order has been shipped. Please understand that we solely rely on the tracking information to serve as proof of delivery, so once a tracking number states "Delivered", we cannot be held liable for lost or misplaced packages. In this unfortunate instance, you must contact the courier of your choice for additional assistance. If you notice damage before removing the bubble wrap, please take a picture of the inside of the delivery box while your purchase is still intact. Snap another picture of the outside of the delivery box. Once unwrapped, take a picture of the damaged item. Then please take a close up shot of the damaged part(s). All damaged products must be reported to us within 72 hours of delivery. It is YOUR RESPONSIBILITY to check all the items upon delivery. KING's Pipe will not be held responsible for broken parts or products not reported to us in a timely manner. Once we receive your email, we will respond within the day or the next possible business day. We thank you for your understanding. For items damaged during shipping, please keep the glass in its box away from harm. Do not discard the item. Please take a picture of the inside of the delivery box while your purchases are still intact. Once unwrapped, take a picture of ALL the items included in the package next to your Order Invoice - Packing Slip. All missing pieces or products must be reported to us within 48 hours of delivery. It is YOUR RESPONSIBILITY to check all the items upon delivery. KING's Pipe will not be held responsible for missing parts or products not reported to us within the given timeframe. Once we receive your email, we will respond within the day or the next possible business day. We thank you for your understanding. Please check our Return Policy Page.